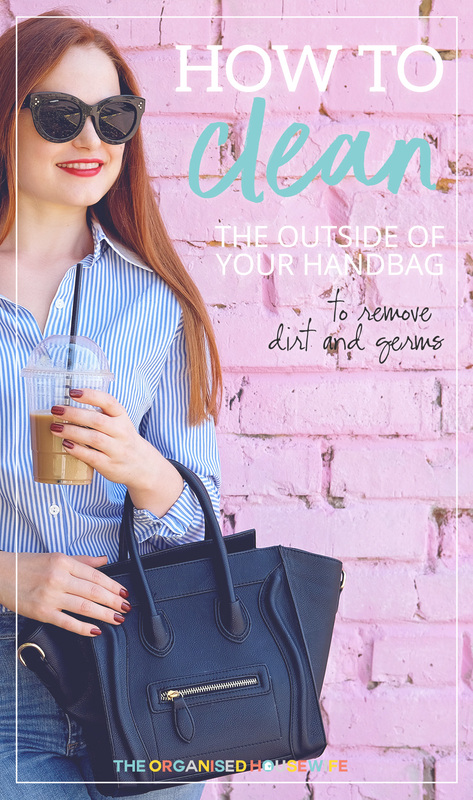 Have you ever considered how dirty the outside of your handbag is? While it may look clean more than likely it has germs and bacteria all over it. Sometimes I cringe at the thought, especially when I see women place their handbags on public bathroom floors…. eew. Please use the hooks on the back of the door ladies! They are also often placed on the floor at your feet while you are seated on a bus, at the movies, in a food court, in shopping trolleys where it then picks up all the germs, dirt and bacteria from each of these places. Further to add to this disturbing information, what do you do with your handbag when you get home? Do you place it on the kitchen bench, dining table or on your bed? If so, you are now spreading those germs from your bag to your table, it is an endless cycle. Are you cringing now too? I use my homemade antibacterial wipes to clean just about everything, except I don’t use it on my handbag or purse. It’s best to avoid using products with vinegar as it may stain your handbag. Place ingredients into a small spray bottle. Spritz a mist of cleaning solution onto a microfibre cloth (not directly onto your handbag). You don’t want to saturate the cloth as this may damage your handbag. Wipe gently over handbag to remove all dirt and grime. Remembering to wipe over the straps, buckles and stitching. Wipe handbag with a dry cloth. Please test this method in an inconspicuous area of your handbag to ensure it doesn't damage it. DETERGENT – will help lift dirt and grime. Preferably PH neutral, colour free, fragrance free and septic tank safe. You can find at your local supermarket, Earth Choice, Fragrance-Free Morning Fresh (ph neutral) and ecostore. This post was originally published on 5th August 2011, it has recently been updated. 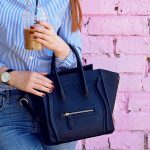 When was the last time you cleaned your handbag? I have this same organiser. I washed it as I had slopped coffee inside my bag (luckily it landed mostly on my organiser!). And it came up a good as new! Love it! I am not the most organised person by a long way as both my work desk and home prove on sight. I love the idea of the Brag Bag organisers as I love the bigger bags but can never ever find anything in them. Too often tampons and condoms on view for all to see as I tip my bag looking for my phone that has just rang off. Maybe I should practise what I preach to my kids. A place for everything and everything in its place. that looks so handy! I gotta have one too! The organizer looks great! I live in the U.S. and really need to find one! I agree with the need to sanitze handbags — they go so many places with us in a day! I use baby wipes with a drop of tea tree oil, works like a charm. I agree our bags get a hard time of it. I always use a hook (if provided) while using a toilet and have thought about whether it could be stolen off that hook. Good luck to a thief trying to do that with mine. It’s quite bulky and probably too heavy to lift easily over a door and under the rail quickly enough to get away. I also have a hook I can hook my bag handle on to if at a table or somewhere else it can be used and I have a carabiner I can hang off trolleys or anything else which also protects it from being stolen. Trolleys now also have a hook attached near the child seat for our bags. We can’t always avoid the places where we may have to place our bags though. There are times when it simply has to be put on the floor or a dirty surface and we certainly don’t immediately clean it when we pick it back up and leave. So, for the sake of simple hygiene, please don’t put your handbag on a table anywhere!! No benches, counters, etc. Keep it on you, put it between your feet if you have to free up both hands, or sandwich it between you and the counter to pay, etc before putting it back on your arm, but DON’T put it on the surface. I have a new tote bag made of canvas, not sure if I can use this method to clean my new bag? You could still use the above suggestion to clean your bag, although don’t dampen too much as it may leave a water mark .